La Potinière has been a legendary restaurant in Scotland for more than a quarter of a century, situated on Gullane's Main Street. This modest restaurant, just thirty minutes from Edinburgh is owned by award winning chefs Mary Runciman and Keith Marley who have established a very loyal following of diners, who come from far and wide to sample their accomplished cooking. Mary and Keith not only run the place as a double act, they also share the cooking. Their concise menu makes good use of local seasonal products ensuring the excellent quality and flavour of their dishes. To start, the choice might be between a warm Parmesan custard with rocket, slow-cooked baby plum tomatoes and pesto or duck, foie gras and Armagnac parfait enlivened with rhubarb and cinnamon compote. Next there might be Thai coconut soup with scallops before a pair of main courses ranging from grilled Dover sole served on smoked salmon and cucumber risotto with tomato and marjoram sauce or roast fillet of beef (the owners are founder members of The Scotch Beef Club) with celeriac, potato and truffle dauphinoise, seasonal vegetables and wild mushroom jus. As a finale, there's a choice of two desserts – perhaps warm chocolate pudding with pineapple compote, vanilla sauce and Amaretto ice cream or a 'trilogy' of apples – then a plate of cheeses, coffee and petit fours. The wine list is an ever-evolving slate peppered with interesting, good-value bottles particularly from France and the New World. 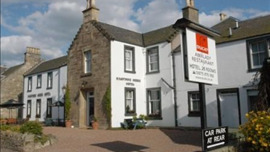 The restaurant is listed in all the major restaurant guides and La Potinière has won the East Lothian Food & Drink award for fine dining in East Lothian since it started in 2006.